“My Mother’s Life in Cuba: In Her Own Words” is the topic of a talk planned by genealogist Martin Fischer for the Sunday, Nov. 19, 2017, meeting of the Jewish Genealogical Society of Illinois. Fischer’s presentation, based on his mother’s 25-page memoir about life in the Havana Jewish community from 1928 to 1942, will begin at 2 p.m. at Temple Beth-El, 3610 Dundee Road, Northbrook, Ill. The JGSI meeting facilities at Temple Beth-El will open at 12:30 p.m. for those who want to use or borrow genealogy library materials, get help with genealogy websites or ask genealogical questions before the main program begins at 2 p.m. For more information, see jgsi.org or phone 312-666-0100. Martin Fischer will present excerpts from the memoir written by his mother, Chana Anita Levik Fischer (1921-2007), who, in the wake of the turmoil of the Russian Revolution, was conceived in Russia, born in Poland, grew up and was educated in Cuba; and got married, raised a family and had a career in the United States. After briefly summarizing her earliest years, Fischer will focus on the period from 1928 to 1942, when Chana Levik and her parents, Abraham and Dweire, struggled to adjust and make a living in Havana, Cuba. Despite a promising business venture begun by Abraham shortly after their arrival in Havana, the family was soon to become victims of the worldwide Great Depression and eventually came to depend on the local Jewish community for employment. Although language differences, status as a foreigner and a life in and out of poverty created obstacles, Chana Levik managed to gain a valuable education in Cuba. She attended a free public technical high school, which prepared her well for a career later in life as a laboratory technician at Jewish Hospital in St. Louis, Missouri. 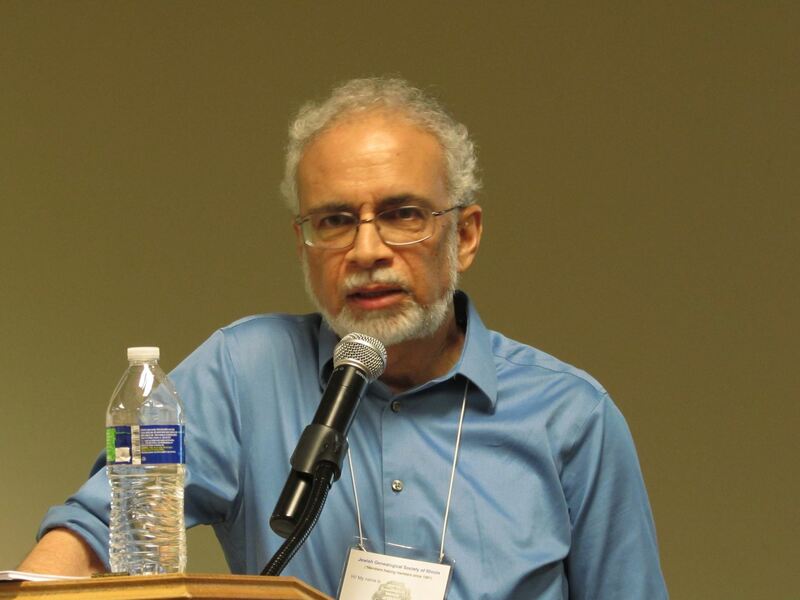 Martin Fischer, vice president of publicity for the Jewish Genealogical Society of Illinois, is also a member of the Association of Professional Genealogists, International Society of Family History Writers and Editors, and St. Louis Genealogical Society. He has been doing genealogy research since the 1970s and has an extensive family history website. Fischer has written articles for Avotaynu: The International Review of Jewish Genealogy, Association of Professional Genealogists Quarterly, St. Louis Genealogical Society Quarterly and the Chicago Tribune, as well as Morasha, the Jewish Genealogical Society of Illinois newsletter. He is a part-time copy editor at the Chicago Tribune and an adjunct instructor at the City Colleges of Chicago, where he teaches online sociology courses. He is a former associate faculty member of the University of Phoenix in Chicago, where in recent years he taught social science and introductory college writing courses. At each regular JGSI monthly meeting, a genealogy “help desk” will operate from 12:30 to 1:45 p.m. Member volunteers will access online databases and answer genealogical questions one-on-one for members and visitors as time allows.